Thanks to Adam over at The Roof Beam Reader for hosting this years Austen in August Reading event. Be sure to check out this post for lots of great posts on all things Jane Austen. My commentary contains major spoilers. 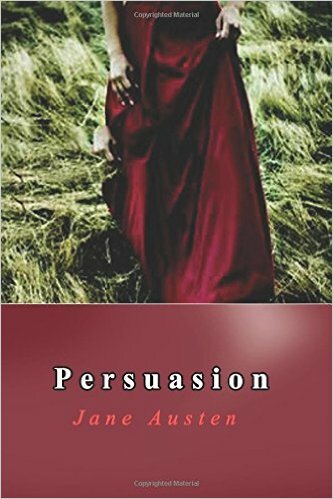 Persuasion by Jane Austen is a revered classic that lives up to its reputation. The plot centers around Anne Elliot. The activities and interactions of Anne, her family and her friends make up the plot. The prospects for marriage of Anne, and other characters as well, drive much of the narrative. Anne is in her late twenties and has not yet married. Years earlier, under pressure from her family and friends, Anne had broken off an engagement with Captain Frederick Wentworth. When Wentworth returns to the scene, the stage is set for much of the drama that comprises the book. Like many great works, there is much to ponder here. One of the major sources of interest is the state of Anne’s personality and psyche. She is surrounded by people who undervalue her and who do not appreciate her virtues. She is often used and put upon. Her father, Sir Walter Elliot, and sisters are narcissistic and often behaved childishly. Her one friend who seems to appreciate her, Lady Russell, had unfortunately given Anne some very bad romantic advice when she urged Anne to break off her engagement with Wentworth. I think that there is something dark and melancholy going on in Anne’s psyche. In today’s world she might be said to be suffering from depression. Perhaps, because her personality is in some ways understated, she is someone who does not outwardly display strong emotions. This inner sadness is easily missed by both the other characters in the novel as well as by its readers. Perhaps this despondency would be overlooked even in today’s world due to the fact that Anne seems to be such an inward thinker. Quiet people sometimes hide their melancholia deep within their soul. In my opinion, Austen has portrayed this brilliantly here. The state of Anne’s mind seems to be a function of several factors. She is surrounded by people who are of lesser substance than her. They undervalue substantive ideas, reading, real emotions and ethical behavior. At times in the narrative, one gets the sense that they are draining her. In a striking passage, Anne’s father and sister enter a room where a cheerful gathering is taking place. It is clear that Wentworth was the love of Anne’s life. Before his return, however, he had faded into the past. The one missed opportunity for a special human connection seems to hang around Anne’s neck like an albatross. As the walk proceeds, the symbolism and imagery of autumn seem to come into play in an important way. It seems that autumn, “that season of peculiar and inexhaustible influence on the mind,” has been ingrained into Anne. Notably, as the book ends, Anne and Wentworth are happily married, but there still seems to be that hint of dread in Anne’s soul. There is the prospect that Wentworth might be called back to active duty and thus away from the household. This subtle sadness inherent in Anna’s character has helped make this my favorite Jane Austen book thus far. I hade previously read Emma, my commentary being here, and Pride and Prejudice my commentary being here and here. There is a lot more to this book. 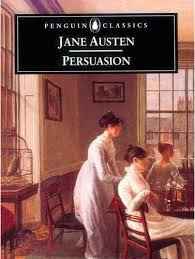 It is full of Austen’s dry humor, keen insights into human relations, dynamic characters and an entertaining and fun plot. The writing is outstanding. I highly recommend this work for anyone who is even remotely interested in this type of novel. It is simply one of the best of its kind.